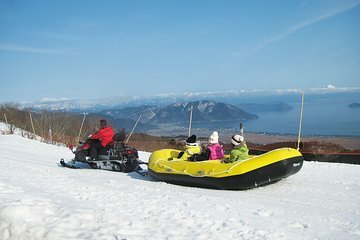 Spend a day in the snow with beautiful views of Lake Biwa from the ski slopes. With 3 convenient pick up stops at Umeda, Namba and Kyoto Stations, it’s easy to hop on the tour bus and enjoy a trip to the mountains. Choose from 2 package deals: ski or snow play at Hakodateyama Ski Resort. Children, beginning, and advanced skiers will find activities at their level. One reason we went there was because Kids Snow Land was advertised showed jumping castle and rubber ducky rides we have 3 young kids, and there was nothing going on, all there was, was a fenced off section for kids and some adult beginners to try ski. that was it Kids Land and they still tried to charge 500yen to go in there, there was no wind it was not snowing so there was no reason for there to be no Kids Snow Land open?. None of the staff spoke any english, there was a lot of staff everywhere you looked running the cafes, the chair lifts, equipment hire, ski instructors ect there would have been over 100 staff running everything and none spoke english not even a little bit? the reason we gave it 3 stars is because the snow was white and soft.